This is the perfect theme for exploring relationships with children. 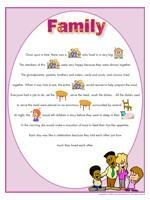 Use our activities to show children how they are an important part of their family! Begin the week with a discussion about what children did with their families over the weekend. Ask them questions about their rituals, what they enjoy doing together, etc. This theme is perfect for having a "Star of the Day". You will need parents' collaboration. Send a note home asking children to prepare a box containing their favourite objects, a few family photos, etc. (inform parents that the photos will be used for a craft and will not be returned). Select a different child to be the "Star of the Day" each day. This child may present the content of his box to the group. If you prefer, you may choose two children per day. Present one in the morning and another one right after naptime. You may invite parents to be present or have children choose a guest of their choice. Ask children about what their parents do for a living, how old their parents are, etc. You will surely be surprised by some of the answers. Ask them if they have any brothers or sisters and how many family members there are in each of their families. Discuss different types of families (separated, divorced, different ethnic cultures, etc.) Ask children if there are any special phrases their parents tell them regularly or if their parents have given them nicknames. Cut a tree trunk out of brown cardboard. Trace children's hands (one hand per family member). Have children cut the hands and glue them to the tree trunk. Write the names of children's family members on each hand. Choose a shape you particularly like (star, moon, heart, animal...) and cut out several copies. On the shapes, glue a picture of each family member. Use string to hang the shapes from a clothing hanger or branch. Variation: Display photos of children's family members on a wall in your relaxation area. The pictures may be used as a memory game or to spark a conversation with the group. Use them to decorate the daycare or a specific thematic corner. (Open picture game - Family) Print, laminate, and store in a "Ziploc" bag or in your thematic bins. Blocks of all kinds children can use to build their house or their dream house. Figurines of all kinds. Children can use them to represent their family. Figurines representing careers or jobs. Children can use them to make associations. Ask parents to provide photos of family members and let children reproduce their portraits. Provide catalogues children can use to cut out people to represent their family. Using portraits or people cut out of catalogues, make a puppet family. 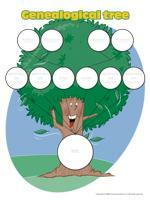 Ask children to draw a tree and complete it with them to make it a genealogical tree. Don't forget pets! Use drawings or two-dimensional crafts to prepare family books with your group. Make a collective mural which represents the children's families. 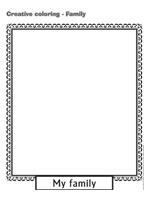 Coloring pages representing family members and activities families enjoy together. Decorate your play home area with pictures of people of different ages. Clothing children can wear to personify a mom, a dad, grandparents or children. Taking care of a baby: dolls, towels, small bathtub, empty bath product bottles children may use to pretend they are washing their baby; bowls, spoons, baby bottles and bibs to feed their baby; diapers and accessories to change their baby's diaper. Family meal: table, chairs, dishes, utensils, tablecloth, candles, plastic food items children can use to reproduce a meal. This is the perfect occasion to show children how to set the table. Memory game with illustrations of animal families (baby, mother, father). Utensils which can be sorted (forks, knives, spoons). You can find inexpensive utensils in large retail stores. Books about animals and their families. 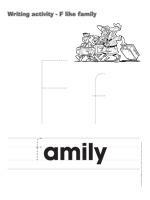 Word flashcards representing different family members, extended family included. Let children practice writing their name and the names of their family members. Provide dotted letters they can trace. Take a walk to the playground to play, just like a family. Water table: wash dishes after lunch, as a family! You will need dishes, dish towels, and of course, soap for bubbles! Water table: dolls, soap, and facecloths to give them a bath. Water table: laundry time (doll clothes). Hang to dry on a clothesline using clothespins. Recognize different sounds we hear around the house (there are several store-bought games for this or you can make your own): doorbell, telephone, washing machine, etc. Box containing a variety of objects from around the house (toothbrush, crayon, comb, etc.). Children can touch and identify them. Bake a cake together, just like a family! Prepare a cookie recipe. Place them in jars and send home for children to enjoy with their family. (Open picture clue story - Family) Print. Sit in a circle with your group. Begin reading the story. Pause for each picture clue. Point to the clue and have children guess the missing word. Photocopy pictures of the children or use pictures provided by parents. Cut them out and glue them to 10 x 13 paper. Place the pictures in sandwich "Ziploc" bags, two pictures back to back per bag. Staple all the bags together at the closed end so you will be able to open them if needed. Use colourful adhesive tape to cover the staples. Join the bags together to make a family photo album for each child. Leave the albums in the reading area. Call children, one at a time. When it is their turn they must ask you if they may execute animal moves. For example, a child might say, "Mommy, can I hop like a frog?" If you say yes, the child hops like a frog until you call out his name again. You may decide to respond, "No, you are part of the dog family!" In this case, the child must walk and bark like a dog. Other animals which are easy to act out are: chicken, snake, horse, kangaroo, etc. Choose two children to be the Mommy Monkey and the Daddy Monkey. Standing in front of the other children (baby monkeys), they move like monkeys. The baby monkeys must repeat their every move. Touch a child with a wand to transform him into a baby, a child, a parent, or a grandparent. The child must act out the role you gave him. One child is the leader. He acts out various adult actions and the other children must imitate him. Make a mural. Have children press their hands in paint and make hand prints on the mural. Invite parents to do the same and write their names below their respective hand prints. Ask parents for a family recipe. Each day, select one family's recipe and prepare it for the group. (Open genealogical tree) Print for each child. Have parents complete the activity at home, with their children. During a special activity, each child may present his family. Divide children into three groups. One group is the elephant family, another group is the monkey family, and the last group is the lion family. Whisper into children's ears which animal family they belong to. When you give the signal, children must imitate the correct animal. Deposit hoola hoops on the ground. Children hop in them, with their feet close together, to imitate a kangaroo mother. During a walk with your group, collect objects of nature: small branches, flower petals, etc. Make sure you find one pinecone per child. The pinecone will be used for the body. Have them paint their pinecone. On either side of the pinecone, glue small branches to represent the arms. Use the petals for the eyes, etc. Variation: You may also combine items found in nature with arts & crafts material to complete this activity. Children can make an entire pinecone family using various sizes of pinecones. 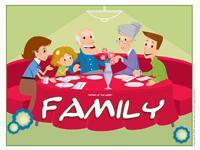 (Open association game - Family) Print, laminate, and cut out the illustrations. Encourage children to distribute the objects to the correct people. 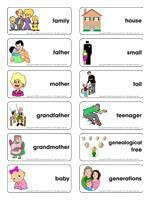 (Open story and memory game - Family) Print, cut out, and laminate the illustrations. Place them face down on the floor. Children pick three cards and invent a story in relation to the illustrations. (Open hunt and seek - Family) Print and laminate. Children search for the items in the larger picture. Cut people out of magazines. Have children place them in order, from the smallest to the tallest. Children bring a few baby pictures to the daycare. They mustn't show them to the other children. Display them on a wall and let children guess who the babies are. Don't forget to add a picture of you when you were a baby! Throughout the theme, ask children and parents to bring a food item of their choice to the daycare. Use the food items to create a special recipe which will become your original family combo! Your challenge is to use all the ingredients in a single recipe, without having suggested the ingredients beforehand. The result should be interesting! If you are unable to use an ingredient, you may use it to decorate the dish. Children will love this! Variation: You may request food items belonging to a particular food family such as the fruit family. Preparing a fruit salad is simple! Make different sizes of gingerbread men with your group. They will enjoy recreating their family. In a bowl, beat butter and sugar until smooth. Incorporate the egg and molasses. Combine dry ingredients and incorporate in creamy mixture. Stir well. Wrap dough in plastic wrap and refrigerate for at least 2 hours. Roll out the dough to 1/4 inch thickness on a floured surface. Use cookie cutters to shape cookies. Deposit on a lightly greased cookie sheet. Bake at 350⁰F in upper portion of oven for 12 to 15 minutes or until cookies are firm and golden. Cool on wire rack. Children will enjoy decorating the cookies and presenting them to their families. Purchase one package of Pillsbury gingerbread mix. On a large piece of cardboard, trace the outline of children's bodies. Let them decorate their body outline as they wish, drawing clothing, features, etc. Cut out the silhouette (two arms, two legs, and the head) and assemble with fasteners to make it articulated. Cut people out of catalogues. Glue them onto cardboard to create a family. Give each child four Popsicle sticks and show them how to glue them together to make a frame. Have children paint their frame and add glitter. Add a picture of their family. Children draw their family on a paper plate. Punch two holes near the top of the plate and thread a piece of yarn through it to make a pretty family frame. Use modeling dough to shape figurines representing family members. (Open craft - Maple leaf family) Print one maple leaf for each child. Invite children to create the "Maple leaf family". Children simply color, cut out, and glue the maple leaf onto cardboard. They can add eyes, a nose, and a mouth. (Open creative coloring - My family) Print for each child. Have children complete the picture by drawing their family portrait.